Every now and again, a perfectly square political peg finds a sharp-cornered square hole. The officer and the office, the doer and the thing done, fit so exactly that the angels in heaven rejoice. The appointment of Lord Shinkwin as a Commissioner for the Equality and Human Rights Commission (EHRC) is wonderful for him and good news for all who care about conservative and Christian apprehensions of equality, rights and justice. He is not only devout in his Christian faith, but tireless in the application of his theology to the cause of conservative philosophy. He has lived with a severe disability since birth, and has worked to tackle disability discrimination throughout his career. And that includes disabled children in the womb, for that is among the most ethically incoherent of our equality hypocrisies. 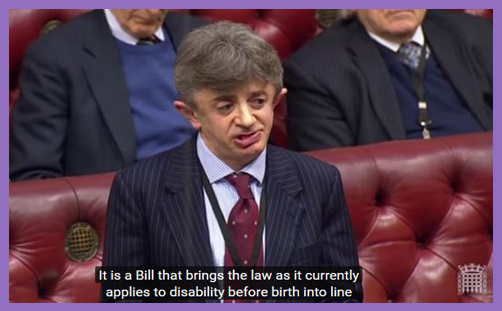 “There’s something deeply disturbing about non-disabled politicians spouting equality and then in the same breath defending a law which is being used as a licence to kill for the crime of being disabled,” he told the House of Lords at the introduction of his Bill to end disability-selective abortion up-to-birth. At the moment, of course, healthy babies may be aborted only up to 24 weeks, but if they are found to be disabled there is no upper limit at all. Kevin Shinkwin could have been legally terminated the day before he was born, along with many of our magnificent Paralympians. “I ask what message it sends if, after birth, I’m good enough for the House of Lords but, before birth, I’m only good enough for the incinerator,” he probed. No one wanted to challenge his logic, of course. Their Lordships shuffled on the red benches, but the incarnate congenital disability was no match for the eradication-by-abortion ideology. Disability-selective abortion numbers have seen a sharp increase in recent years. There were 230 late term disability-selective abortions (between 24 weeks and birth) in 2015 – a 271% increase since 1995. In 2014 the number of terminations for Down’s syndrome increased by more than 10% in the space of just 12 months as new screening techniques became available privately. Whilst abortions for cleft lip/palate, a minor facial impairment, have tripled in the last 5 years. Jeremy Hunt “may ignore and patronise” Kevin Shinkwin, but nothing is going to silence him. He has a mission, a passion, a vocation to contend for greater justice for the unborn, and to eradicate the eugenicists’ prejudice against foetal difference. What a joy it is that he may now do so at the heart of the Commission which is charged with developing, promoting and enforcing all anti-discrimination legislation. If the Prime Minister really wants to build a Britain for everyone, we need to allow the triangular, oblong and heptagonal pegs to find their own holes, and to stop discriminating against the squircle just because we think it shouldn’t exist. Can the Front National offer French resistance to bearded anarchist-types?